Anyone who grew up in the 1980s probably had Ecto Cooler in his or her lunchbox at one time or another. Some may have even used the toxic-green beverage as currency, conducting lopsided lunchroom trades with the kid who wasn’t allowed to have sugar. Regardless of the juice’s hypnotic and addictive properties, the backstory of Ecto Cooler is an intriguing one. And the fact that it was marketed as orange/tangerine-flavored, yet was fluorescent green in color, isn’t even the strangest thing about it. In 1986—riding the last wave of Ghostbusters' popularity—an animated series titled The Real Ghostbusters was created. Knowing full well that the best way to market to kids was to get them high on sugar, Ecto Cooler was created as a product tie-in to the series. Ecto Cooler was an immediate and smashing success. Although it was only supposed to last as long as the series, it endured for a decade after the show’s cancellation. However, the original marketing strategy was rather sneaky, and mind-numbingly lazy. If we look back a bit further, there was once a Hi-C product called Citrus Cooler. Apologies for lack of photo evidence, but it appears to have been systematically destroyed to thwart the conspiracy theorists. Nonetheless, Citrus Cooler did exist—at least it did until some marketing dolts needed a quick and easy gimmick to sell their cartoon. The pitch was simple: place Slimer, the cute green ghost from Ghostbusters, on the box; change "Citrus" to "Ecto"; conveniently forget that Citrus Cooler ever existed; product tie-in achieved. And because we are all suckers for packaging, the farce continued into the next decade. The problem was that this new generation of juice box drinkers would have no idea what a Ghostbuster was. 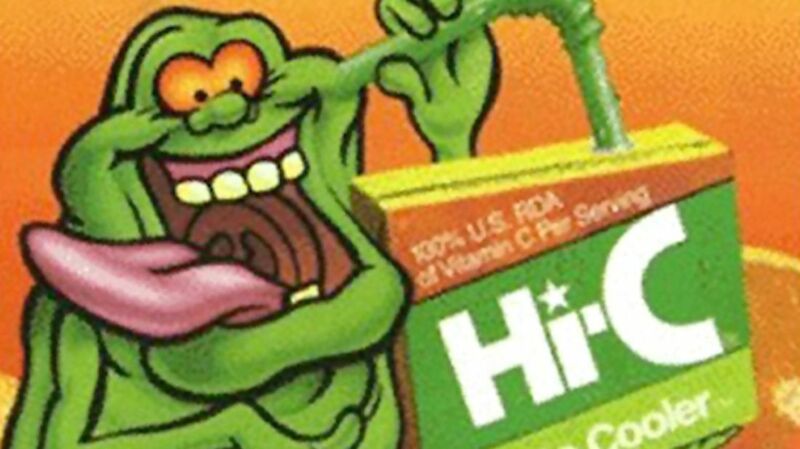 Fearing that Slimer had overstayed his welcome—and in another swift and lazy move—Hi-C did away with Ecto Cooler altogether. Or, at least that’s what they wanted us to think. The identical formula, in all its neon green glory, was about to be repackaged yet again as Shoutin’ Orange Tangergreen (though Hi-C would deny that it was the same beverage). Some conspiracy theorists however, would not rest until the mystery was solved. Although the Hi-C drinking public should have been outraged, at least the name Shoutin’ Orange Tangergreen finally addressed its contradictory flavor and color combination. It all came full circle in 2006, when Shoutin’ Orange Tangergreen was renamed Crazy Citrus Cooler ... then discontinued altogether just a year later. Though Ecto Cooler (in all its various names and incarnations) might be gone, it's hardly forgotten. Every so often, a really old case or can of the real stuff pops up on eBay (a 46-ounce can went up for auction last year for $2000). But DIYers would do well to follow the recipe concocted by Ghostbusters: Chicago Division, who did an exhaustive amount of mixing and taste-testing to come "as least as close to Ecto-Cooler as we can get" (green and blue food coloring included). This article originally appeared on Foodiggity. Follow Foodiggity on Facebook and Twitter.